Cut wings apart at joint and rinse. Put wings into large stock pot and cover with water. Bring to a boil, remove and rinse again then allow to cool. Mix together the rest of the ingredients in a large bowl, taste for addition of any ingredients. Reserve about 1/3 of marinade in separate bowl. Add wings to bowl and toss to cover. Leave to marinate overnight in the fridge or two hours at room temperature. 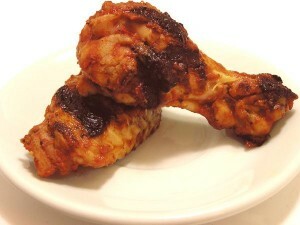 Grill wings on barbeque or indoor grill or roast at 400˚F – 425˚F in the oven until marinade starts to darken and wings begin to dry out slightly. Serve with veggies and blue cheese or a pepper sour cream dip. The only comment I could wrench out of the guys about these wings was that they could have been slightly spicier. I think next time I would use spice-infused olive oil and add some red chilis to the marinade.